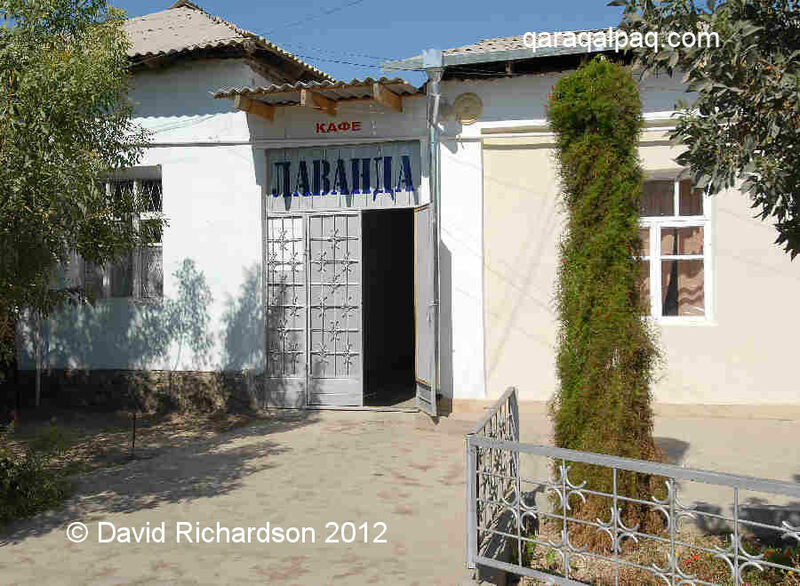 Qaraqalpaqs and other residents of Qaraqalpaqstan generally live on a diet that is rich in carbohydrate. The main staples are flat bread (nan), potatoes, rice, and pasta. Meat, sausage, chicken, and cheese are expensive and are eaten sparingly. 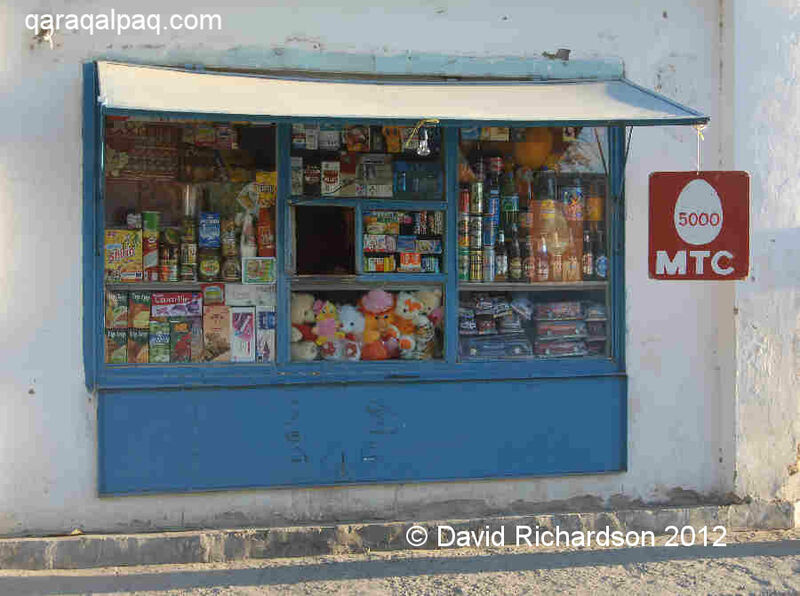 However Western-style junk foods like fizzy soft drinks, biscuits, chocolate bars, and potato crisps are slowly creeping into No'kis and are available from many of the small kiosks that dot the city. 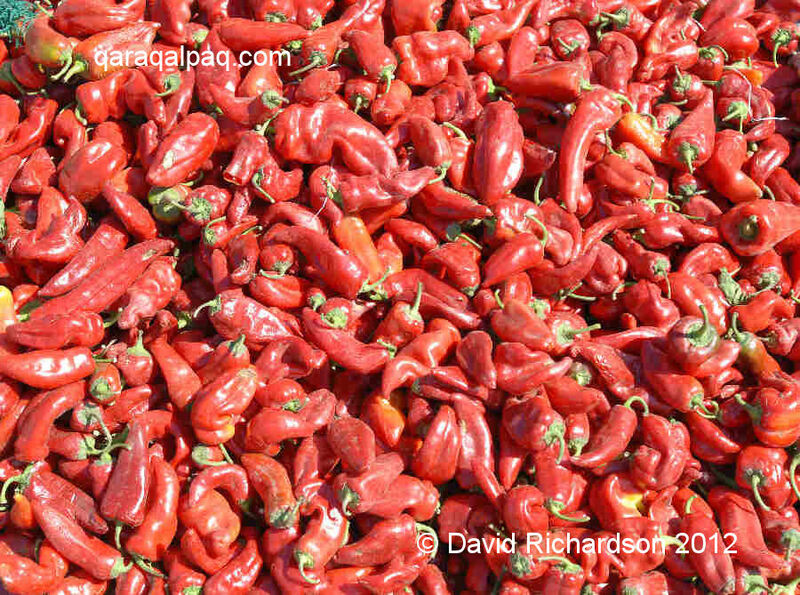 Red chillies for sale on No'kis wholesale bazaar. A dish of pelmeni, probably introduced from Russia. Sweet desserts are rare. A meal at home finishes with some melon, watermelon, candy, or dried fruits and nuts. The usual drink is black or green tea served with sugar. Be warned that the liberal use of cotton oil in cooking can disagree with foreign stomachs! Qaraqalpaqs are big on snacks and you will often find them eating dried fruit, nuts, and sunflower seeds. Our favourites are pistachio nuts and apricot kernels rolled in ash. Restaurant food is a mixture of Russian and Central Asian, with a choice of salads to begin with followed by traditional local main courses. There is little variety in the choice of cuisine offered by the majority of restaurants. There are two exceptions. 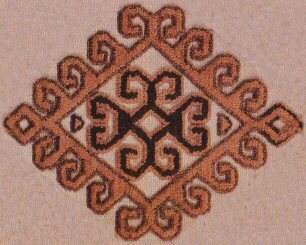 One is from several Caucasian families whose restaurants offer very good quality Armenian and Georgian food, but at a price. The other comes from the small Korean community who were exiled to this region by Stalin. Many Korean families run cafés so you will also find typical Korean dishes such as kim chi (pickled vegetables) and kuk su (spicy noodle soup) on their menus. If you find some of the local pasta dishes a little bland try a jar of Chinese-manufactured "Dindin" brand chilli sauce, available on the bazaar – it goes very well with mantı! If heading out to Moynaq or visiting more remote areas of the delta for the day it is a good idea to take a picnic lunch with you. 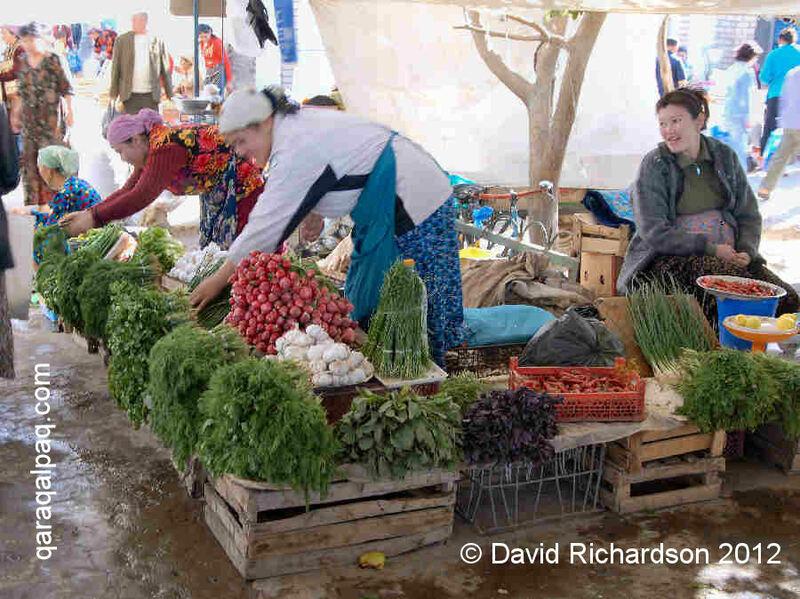 The Central Bazaar in No'kis has a good selection of smoked sausage, cheese, and canned fish as well as a huge selection of salad ingredients, herbs, and fruits. 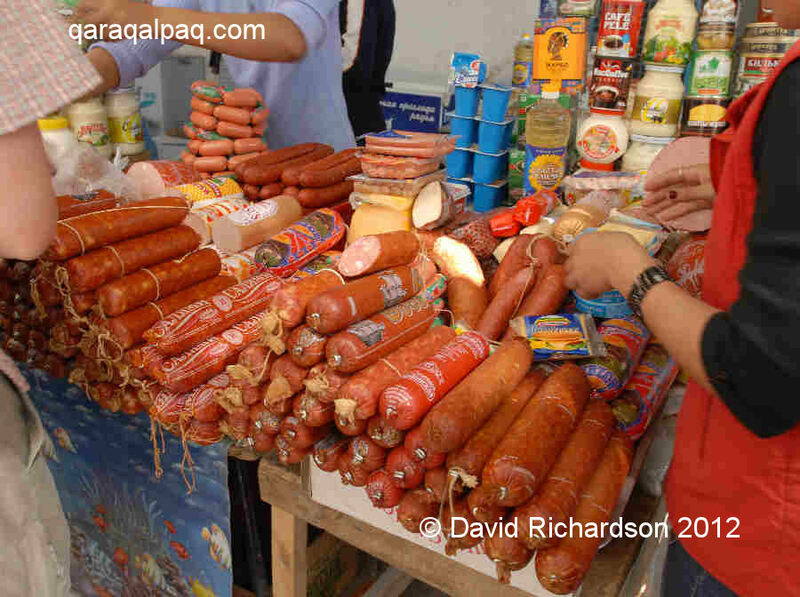 Smoked sausage for sale on No'kis bazaar. Fresh herbs for sale - coriander, dill, purple basil, chives, and spring onion. Depending on the season the cherries and melons can be especially good. Make sure you wash everything well in bottled water before consuming it. We advise you to avoid lettuce, which in any event is hard to find in the bazaar, since it seems to carry a high food poisoning risk. When buying cheese, sausage, or grapes it is usual for the vendor to offer you a small piece to try before you buy. Freshly baked bread is also available at the bazaar - both in the form of nan and tin-baked loaves. 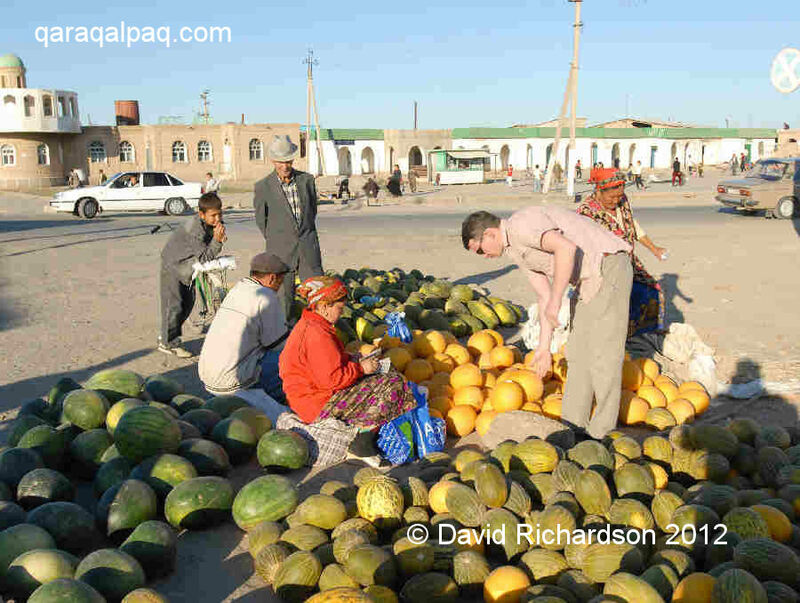 Buying melons on Shımbay bazaar. The cheapest place for beer, wine, and vodka is at the wholesale market, accessed from the street that runs along the north side of the bazaar. 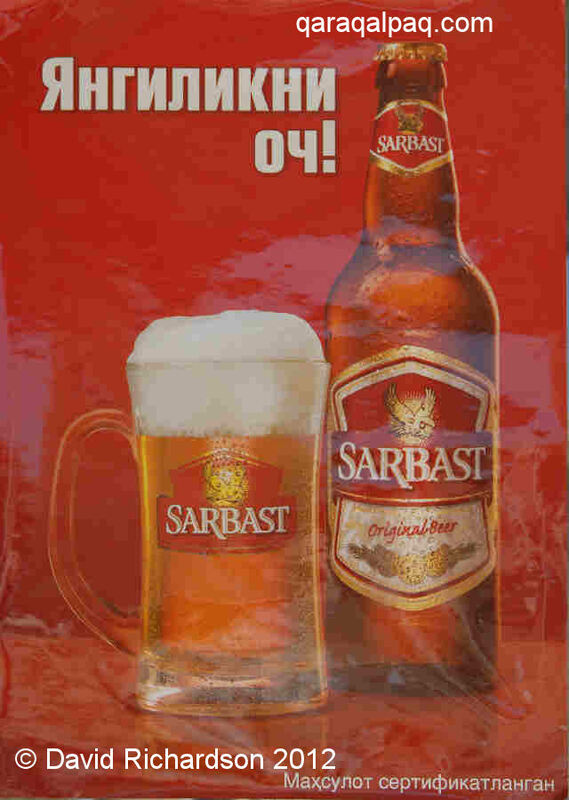 The choice of beer here includes Baltika (Russian), Qibray, and Sarbast – a new beer brewed under licence to Baltika. They are all lager-style beers. A wider selection of beers is available from some of the kiosks close to the NEO restaurant, although at a price. There is another street of kiosks on the left side of Ernazar Alako'z several blocks north of the bazaar. Vodka is sold in half litre bottles and the two most common brands are No'kis and Qarataw. 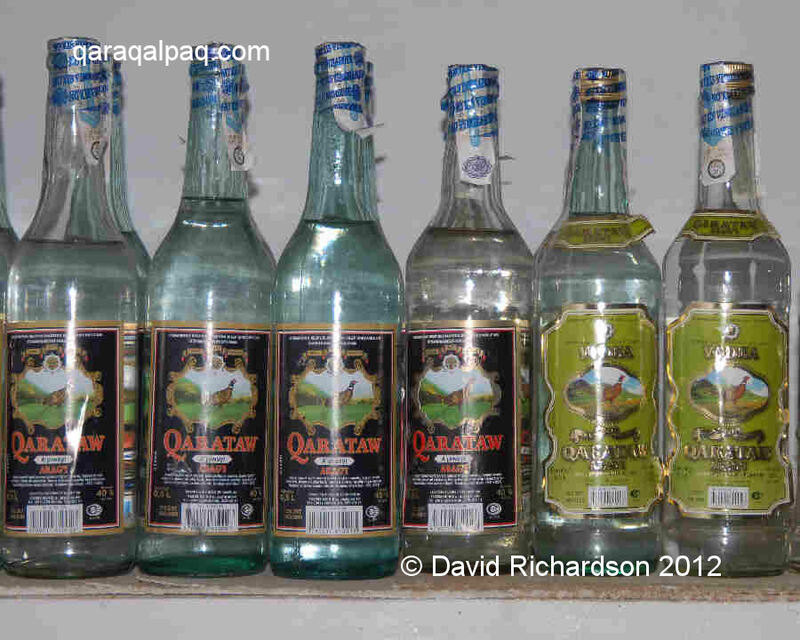 They cost around $2 per bottle and Qarataw is our favourite. A good selection of drinkable wines are now available in No'kis. 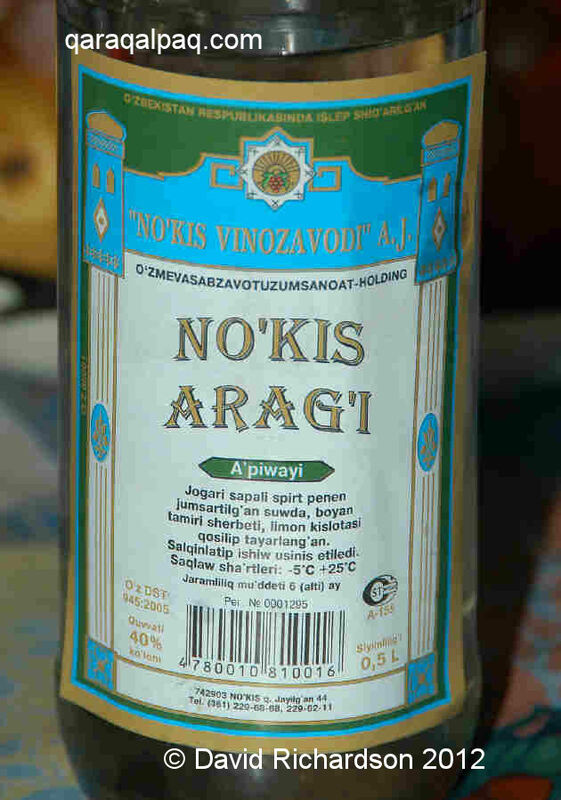 Most Uzbek wines are sweet (shirin, сухое вино) or semi-sweet (nimshirin, полусухое вино). If you prefer something drier try the Vino Italiana brand which is an Uzbek/Italian joint venture. Wine costs around $2-3 per bottle. The "portveyn" is also worth trying. 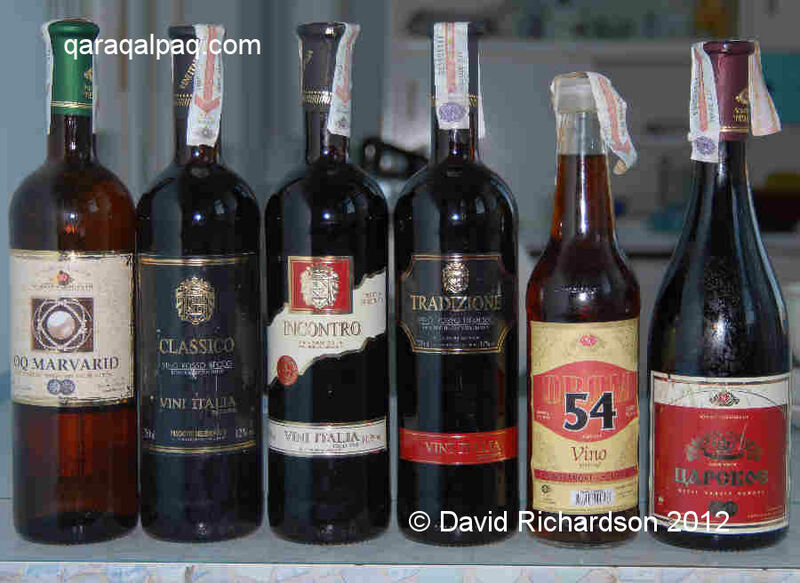 It is a fortified wine probably more similar to sherry than port and comes in half-litre bottles. The most common brand found in No'kis is "54" and it costs around $2. However none of this is kept cold so you might want to try the well-stocked kiosks just round the corner from the NEO instead. They have a range of confectionery and toiletries, cigarettes, beer, and soft drinks some of which are kept in the fridge. The Qaraqalpaq word for cold is suwıq (pronounced suwuk). Summer visitors may be surprised at being offered bowls of hot hearty soup in 30 degree heat. A typical meal consists of nan bread and salads, followed by the main course. The salads can range from the ubiquitous cucumber and tomato to the delicious beetroot and walnut with sour cream. Most places offer black or green tea to accompany the meal. Bottled water, Coke, Sprite, and fruit juices are also common. However they are not always available in individual sized bottles so you have to buy a large bottle instead. Some places have beer, vodka, and wine but others do not. However they are often willing to run down the street to get some for you. Also many places that do not have alcohol are quite happy to let you drink your own and will provide you with glasses. Vodka is sold in amounts of 25 grams. If invited to share vodka with locals be prepared for a heavy session – we call it being mugged by hospitality! Women can decline but men are under a lot of peer pressure to keep up. You may like to try this Qaraqalpaq toast - amanlıq bolsın - let peace prevail in the world. Most restaurants have a small sink with soap and a towel near the entrance where you can wash your hands. Many have pit loos out in the backyard, although there are some exceptions. The restaurant and café scene in No'kis has changed dramatically over the last few years with some places closing down but many new ones opening up. The menus at most of the eateries are very similar. It is not necessary to leave a tip but obviously if you have had good service a tip of say 5% would be very welcome. Note that it is generally cheaper to pay in so'm than in dollars. Below we list places that were open in November 2007. For the location of the central cafés and restaurants check out our map of Downtown No'kis. 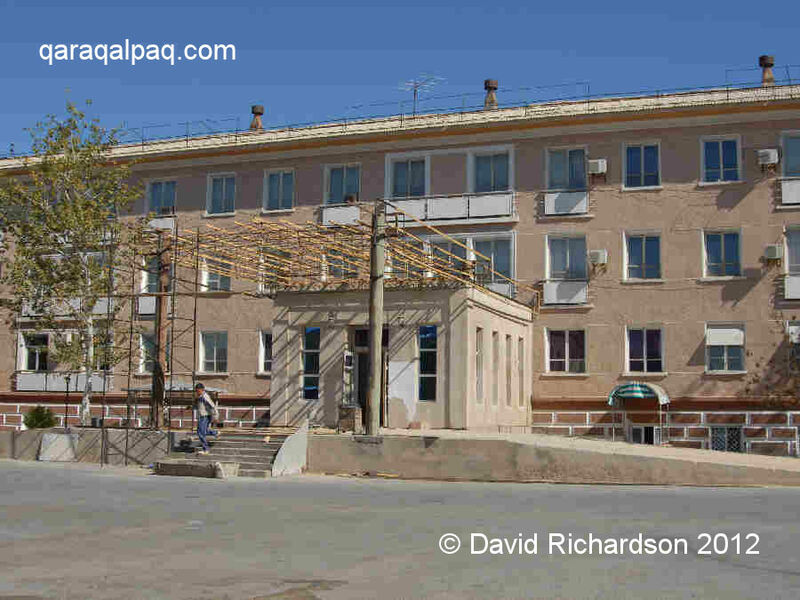 The café at the Jipek Joli Hotel on Rzaev ko'shesi is apparently open to non-residents in the evening but they need to book in advance. From our experience the place is fairly dead at that time of day. Lunch can also be arranged for residents but again advance booking is necessary. We have never eaten here but have heard that they do good omelettes. This 60-seater restaurant is to the left off the lobby of the hotel. It has a bar selling cold draft beer, red wine (Mona Lisa), and liquors. The café of the No'kis Hotel is through the lobby and to the left. Cold beer on tap at the bar in the No'kis Hotel restaurant. It is open at lunchtime and in the evenings until 11pm and seems generally fairly busy. Seating is on benches in the booth configuration so popular here. The staff are friendly though none of them speak English and the service can be slow. The goulash with fries is particularly good. This very smart restaurant is opposite the Academy of Sciences on To'rtku'l Street and makes an ideal break during a walking tour of No'kis. It is probably the best restaurant in town with an extensive menu. There is a music system for evening wedding parties and the like. 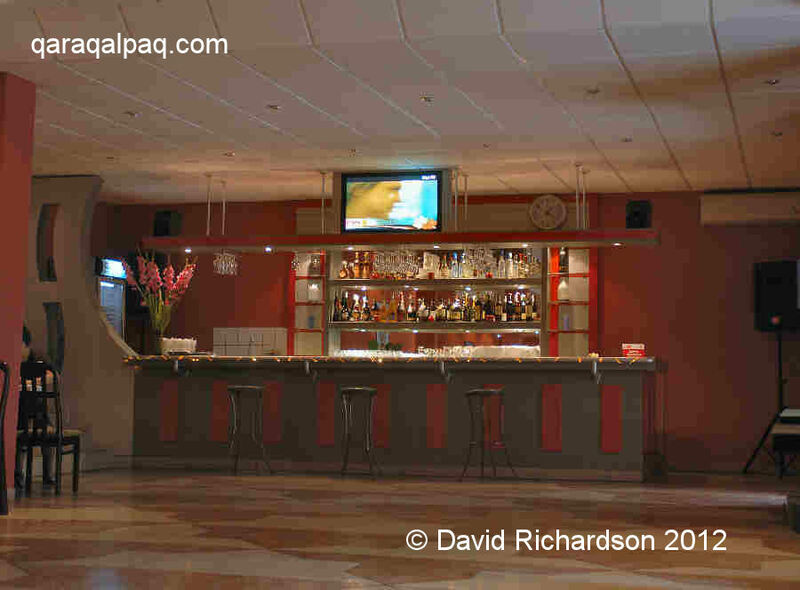 The restaurant has a stylish and well-stocked bar for those wanting an evening pre-dinner drink in civilized surroundings. This restaurant was chosen to host the lunch for an international conference we attended recently and is obviously highly rated by the elite in No'kis. Service was good though somewhat stilted as the staff were trying so hard. The Merlion has the advantage of spotless loos, although they are the traditional squat type. 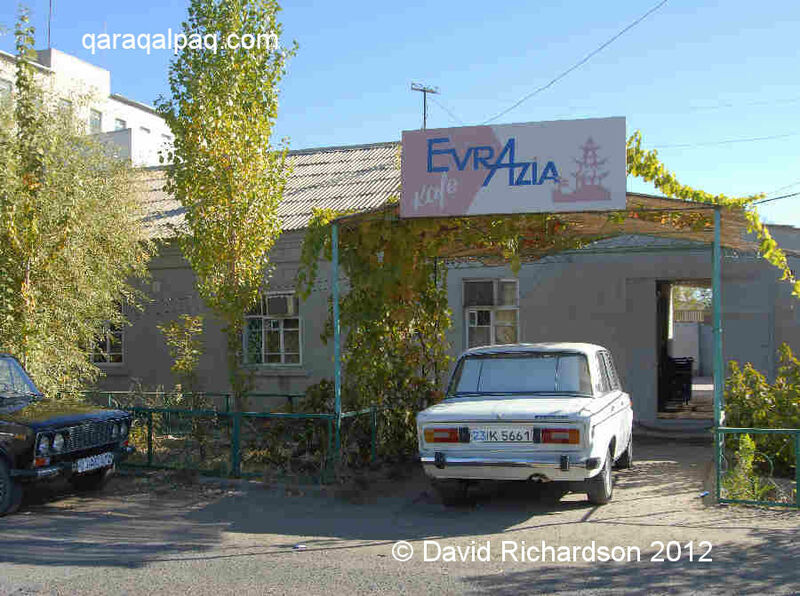 Kafe Evrazia is located on Tatibaev between Rashidov and Pushkin. The two advantages of this restaurant are its proximity to the Jipek Joli and the fact that it has an English menu. The only disadvantage is that mosquitoes can be a problem, but then this is true of most of the restaurants in No'kis. It is a big place with an outside courtyard seating area, although by October it was too cold to sit outside in the evenings. There are more tables in a large room just inside the door, one separated off from the others, and a smaller private room with a single large dining table off to the right. There are electric buzzers for summoning the waitress but unfortunately these were not working so we had to keep searching for our waitress to get service. The restaurant is rather brightly lit in the evening. We can recommend the pork steak and the beef stroganov. Avoid the Kora Kafe almost next door on the corner, which is run by Koreans and is seedy and dirty. 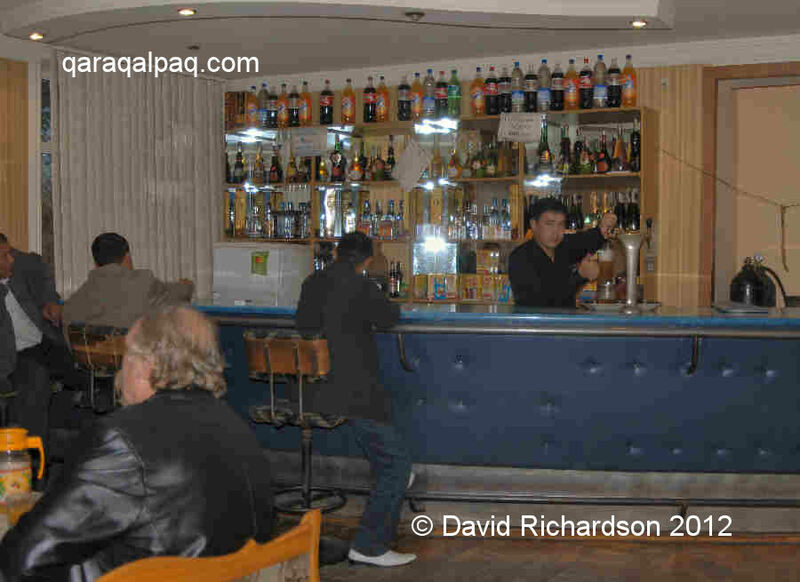 Also run by a family of Koreans and located just across the road from the Council of Ministers building on the corner of Doslıq Guzari and G'a'rezsizlik, the Sheraton Club is popular with government officials and business people. Seating is organized in booths. The Qaraqalpaq dishes here can be quite greasy, but we have not yet tried the Korean dishes. 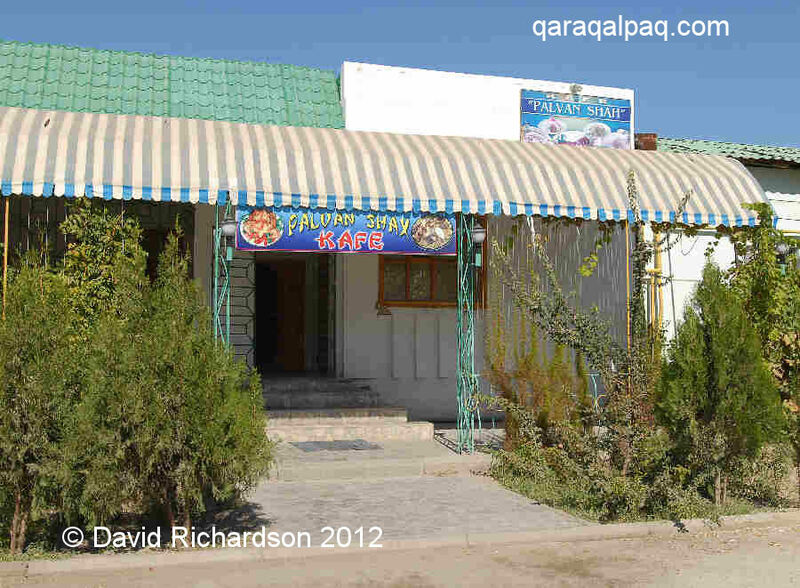 We have tasted their Qaraqalpaq versions of several Chinese dishes which, although not very authentic, do make a change from the standard fare. The place has a clubby feel, lighting is not too bright and it is usually pretty busy. Unfortunately we think it is a bit sleazy. 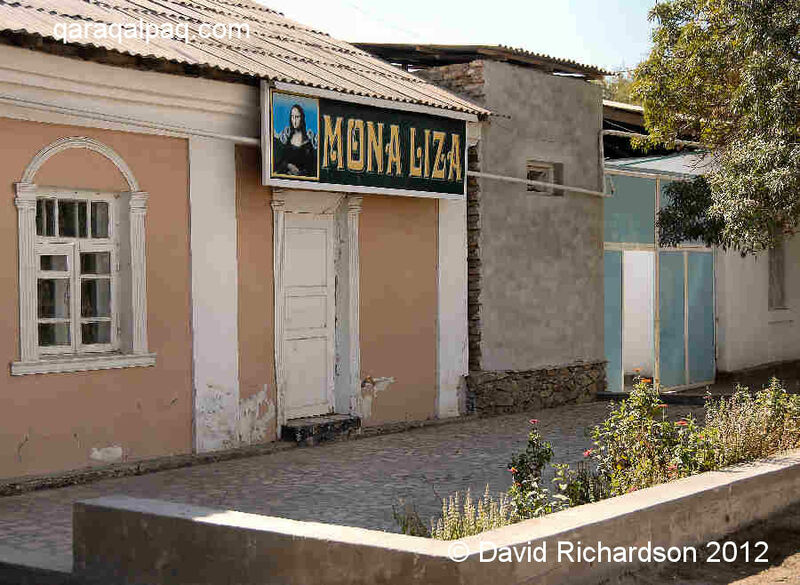 The Mona Liza is run by Ashot, a friendly Armenian. 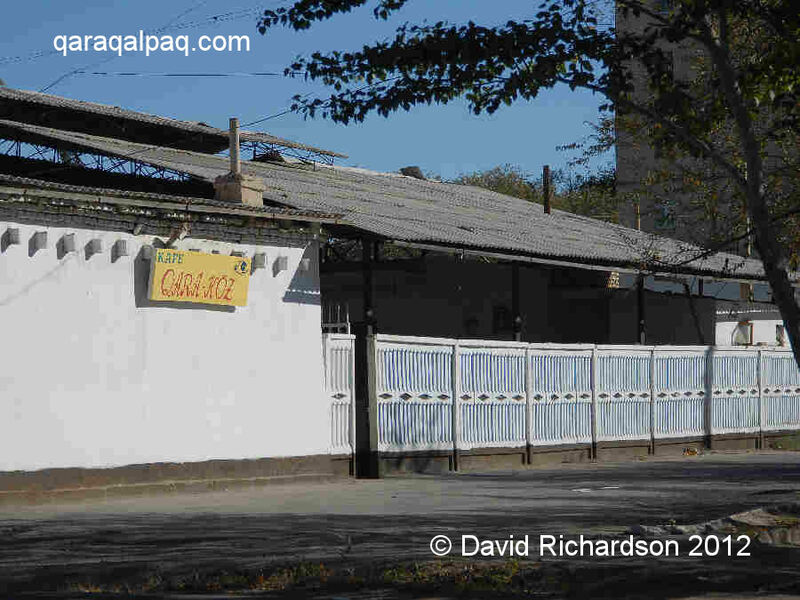 It is located on G'a'rezsizlik just across the Ernazar Alako'z boulevard from the Central Bazaar and although it looks pretty basic it is one of our favourite places. 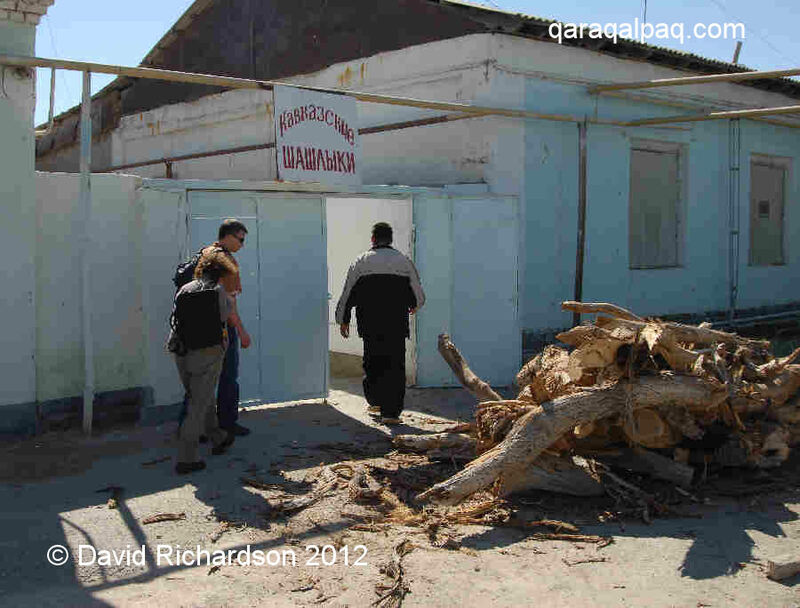 You enter through a large grey garage door after passing someone barbequeing shashlık by the road side. You enter the original part of the restaurant on the left. Inside there is a choice of small private rooms, all pretty basic, each containing a single table, some big enough to hold a group of a dozen. In the summer, tables are arranged in the garden. Mosquitoes can be a problem outside in the evening. Four new rooms have been opened at the back but these lack the character of the original rooms adjacent to the street. You also get charged 1,000 so'm for the pleasure of using one of them! These specialities are large dishes which will feed at least three or four. The Mona Liza does not have beer or bottled wine but you can bring your own. Their homemade cherry wine has an interesting taste but is expensive by local standards at 4000 so'm per half litre jug. Note that 10% service is added to all bills. We always order from the Russian menu. Lonely Planet claims that the prices listed in the English menu are much higher, so be careful. This is a huge place on the west side of Tatibaev with a dance floor upstairs and a small outside terrace along the side. It's the only real night spot in town. Its size and central location means that it is often chosen for hosting official functions and sometimes wedding celebrations. If the upstairs restaurant is already booked for a function you can eat at the terrace outside. However be prepared to be dragged inside to take part in the celebrations! It is very popular with young people and can be noisy at night. At 9-11 Dosnazarov, just north of the train station, this café is popular with wealthier youngsters. It's the Qaraqalpaq version of an American diner. It has waitress service and sofa seats. It also has a shaded outside terrace for the summer. It is open from 10am until 12pm and has karaoke in the evenings. They serve fast food, ice cream, and local alcohol-free cocktails and milk shakes. They don't really do main meals but it is a good place for a snack or a burger in clean surroundings. It is also a good place to meet local young people. 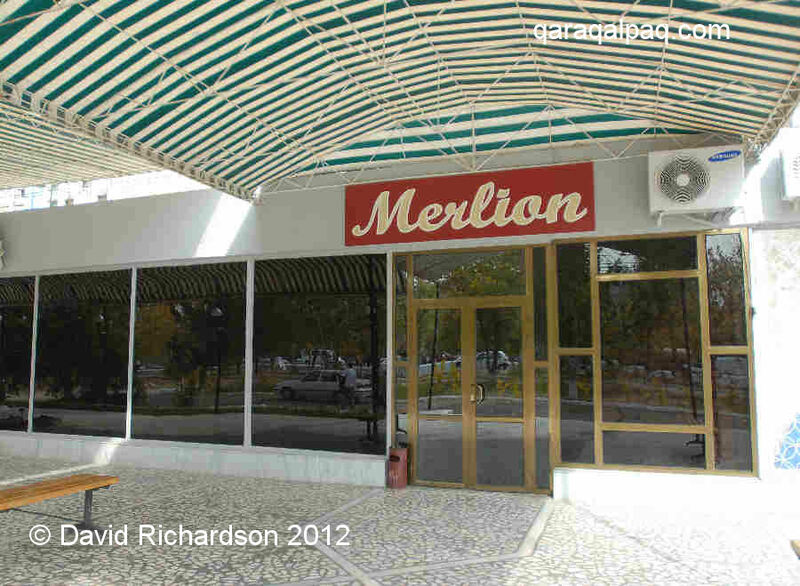 This is a Caucasian restaurant on the south side of Amur Timor ko'shesi, behind the Council of Ministers office block. 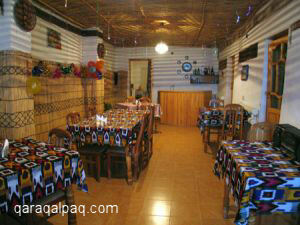 It has a number of small private dining rooms and specializes in pork shashlık. Pork shashlık at the Kavkazskie . The food is good but expensive, with a small stick costing 1800 so'm, a medium one 5000, and a large one 8000. One medium stick makes a hearty meal. The restaurant has small private rooms and there is a BBQ in the rear garden along with a pit loo. Across the road from the Kafé Grand on the other corner of Amur Timur is a very good shashlık café which unfortunately is only open in the evening. It seems to be popular with the after-work crowd. The only thing on the menu is shashlık but the quality is excellent and it is served with piles of fried onions. Beer and vodka are available but not wine, but it is probably okay to take your own. The service is excellent and the prices are very reasonable. If you arrive late you can find that the restaurant has sold out - a healthy sign. 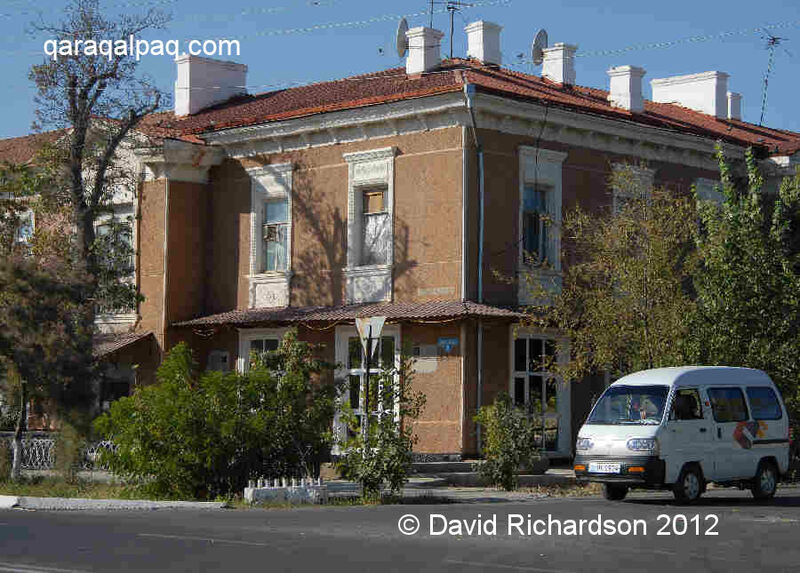 This is on Saraev, next door to the more expensive Palvan Shax Restaurant. The main room is spotless with pale green decor. Seating is in open booths with oval tables and curved bench seating or in private rooms with single tables. They have airconditioning and play background music. It has a big menu with kuk su, cold noodle soup, cabbage soup, and yoghurt soup ranging from 1000 to 2000. Main courses are from 2000 to 4000 and include a good goulash with potatoes or buckwheat, and chicken. Salads include sweet beetroot, spicy carrot, and cucumber and tomato. Budget on about 12,000 for a two course meal for four with tea. There is a clean pit loo in the back yard. Also on Saraev, this restaurant looks smart from the outside but locals tell us that it is expensive (by local standards). We have not eaten there. This is just opposite the Post Office on Patrice Lumumba ko'shesi and is cheap but quite seedy and run-down. There are two crudely made chipboard booths for romantic liaisons or local mafia meetings. Most of the clientele look fairly poverty-stricken. The food is boring but inexpensive. Fried mincemeat with mashed potato and buckwheat, mantı, and noodle soup are all less than 1500 each. The restaurant also sells bottled beer, port wine, and soft drinks. We have not tried this restaurant, which is on Tatibaev. It looks okay from the street and has a fenced-off outside dining area for the summer. 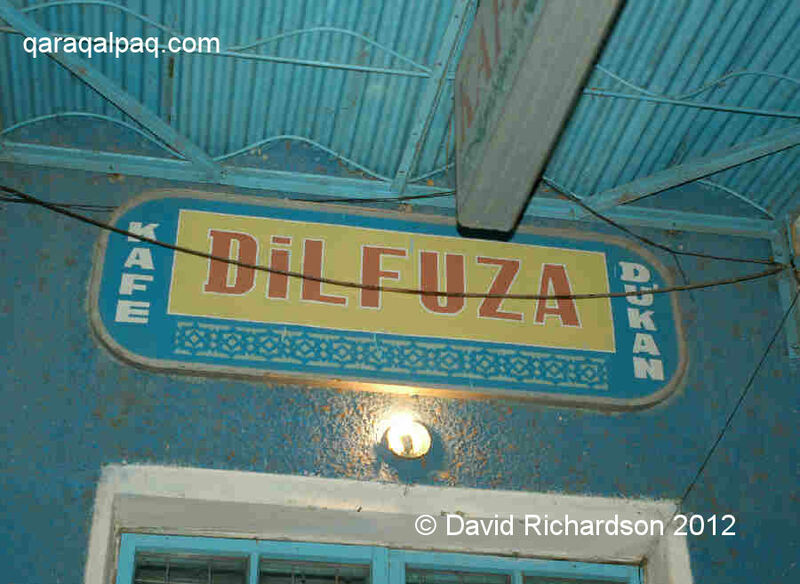 We have not tried this restaurant either, which is on G'a'rezsizlik. It too is Caucasian and has small individual dining rooms somewhat like the Mona Liza. 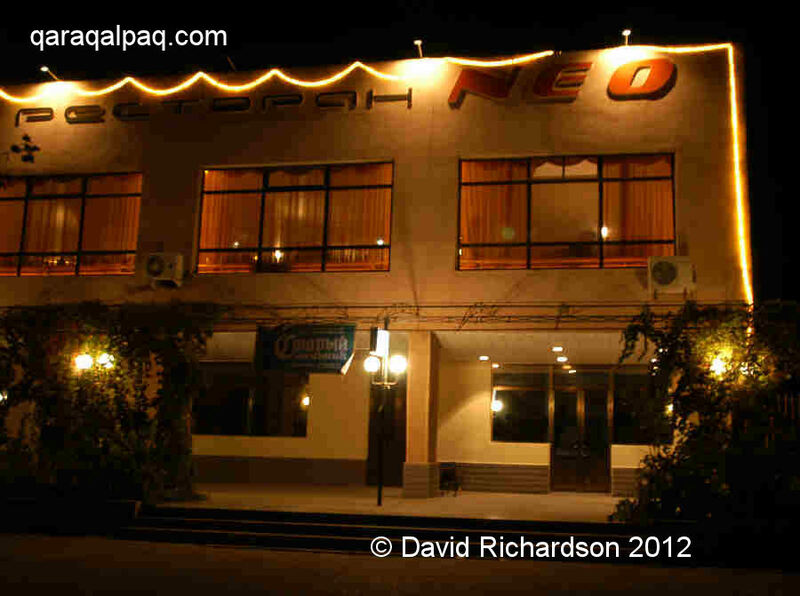 Also untried, this fish and shashlık restaurant is set back off the road on G'a'rezsizlik and offers a refreshing alternative to the normal fare. Despite the fact that most Qaraqalpaq men are crazy about fishing, fish rarely appears on restaurant menus. 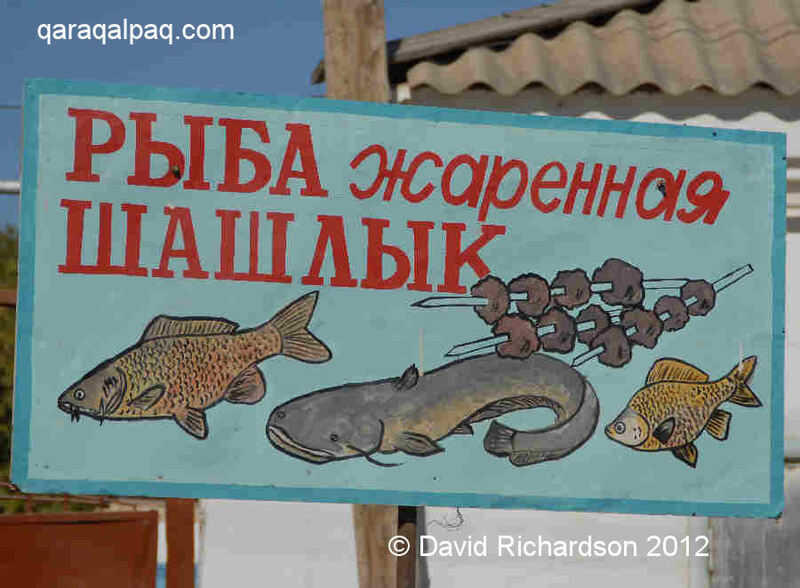 Local fish from the Amu Darya delta tends to be very boney and is best deep-fried. Sign outside restaurant for fried fish and shashlık. 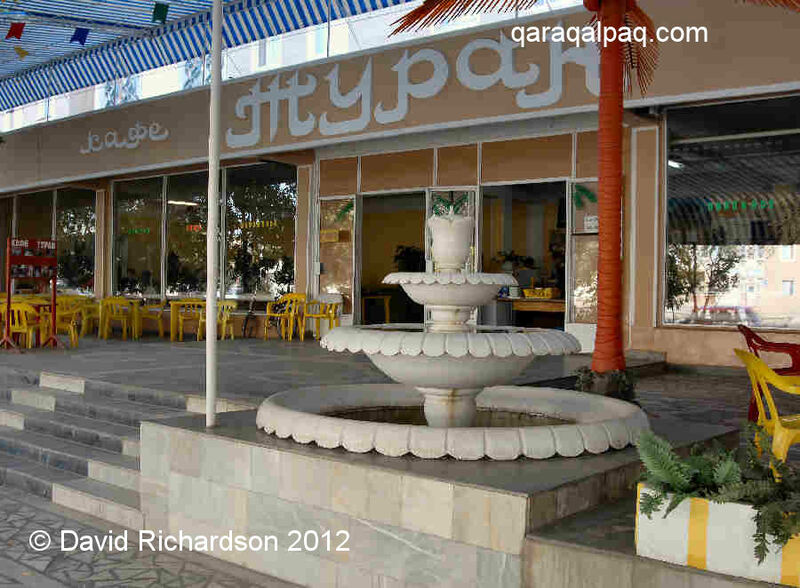 The restaurant is not obvious and is only recognizable from the distinctive sign by the sidewalk with images of balıq or fish. The Aral Asxansal is a big café on the corner of Tatibaev and Qaraqalpaqstan. It has nice signs in the window but is dark and smelly inside. There is a clean shop next door selling soft drinks, Coca Cola, and sweets. For a cheap meal, try one of the street-side shashlık stalls where you can buy lamb or pork by the stick, served with nan bread and raw onion. 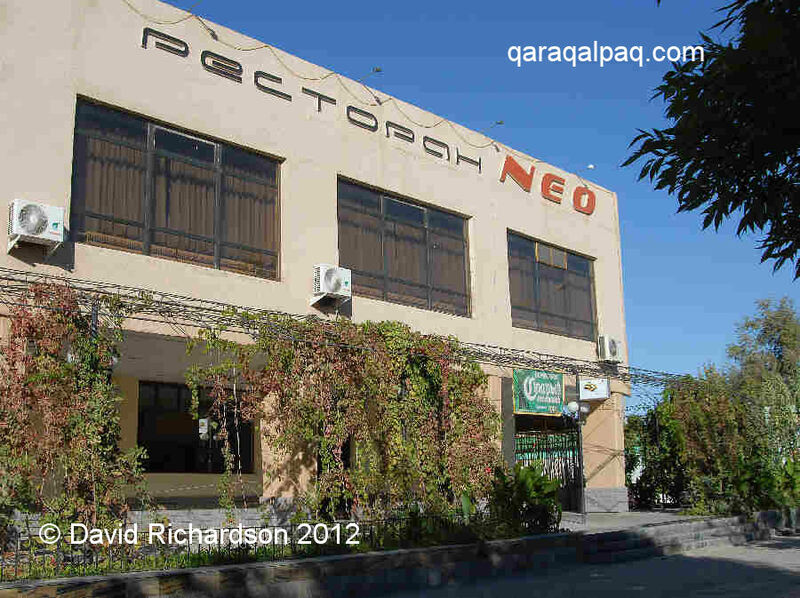 There are a couple operating along G'a'rezsizlik, but there are more on a street that runs west of Ernazar Alako'z down towards the Imperial Restaurant, a couple of blocks north of the Central Bazaar. The Imperial opened as a trendy venue in 1999 but quickly deteriorated into a seedy dive frequented by prostitutes. It is not recommended. 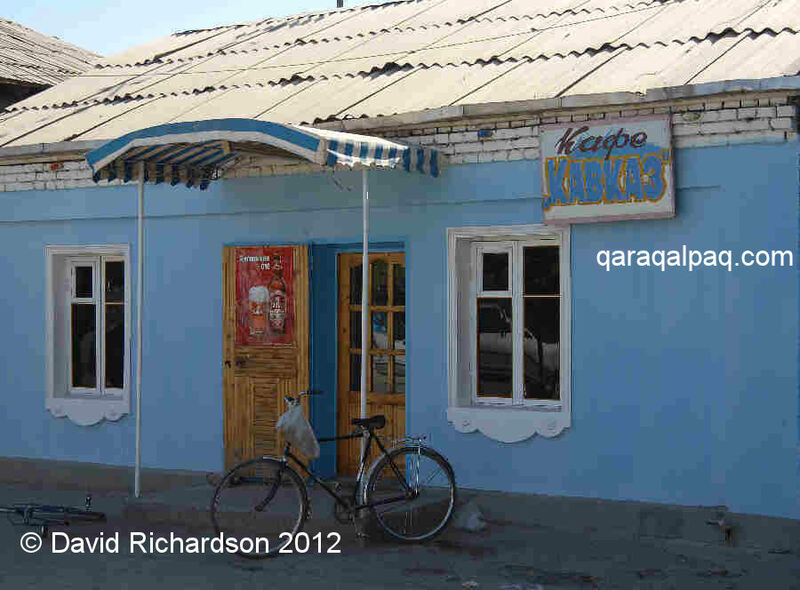 On Tatlımuratov ko'shesi, which runs behind the Savitsky Museum, the Kafe Uslada is so far untried. 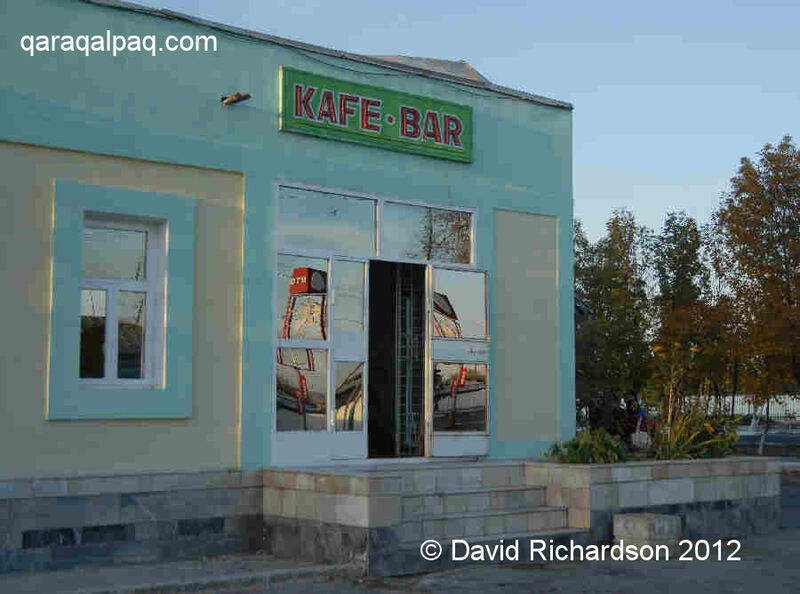 Just across the road is the Kafe-Bar with an open first floor terrace, which should be an ideal location in the summer. 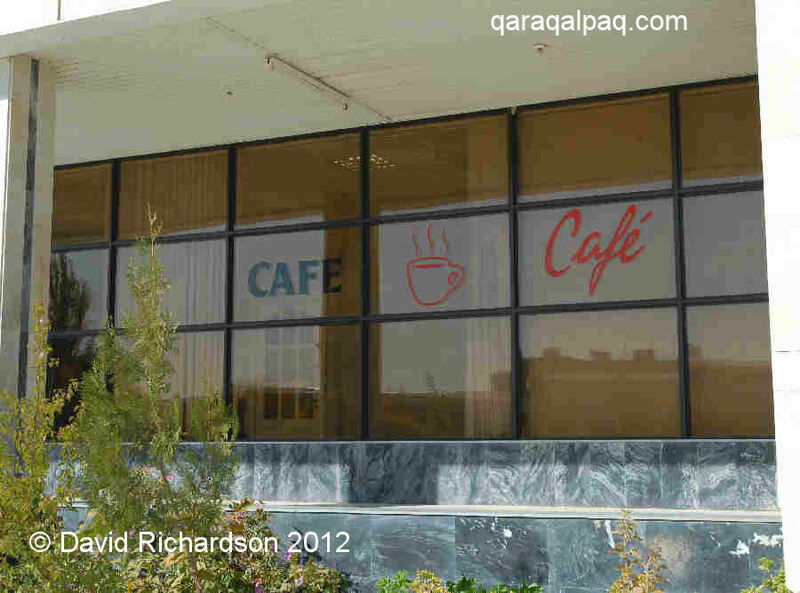 Unfortunately at the time of writing this café was closed due to staff shortages and other difficulties. There seems to be no possibility of it re-opening in the near future. Exterior of the Savitsky Museum café which is unfortunately closed at the moment. It was the best place to buy a light lunch in town, even if you were not visiting the museum. Modern, clean, and air conditioned, it used to offer a selection of simple snacks, salads, yogurts, and chocolate bars, along with soft drinks, tea, and coffee. It did not have a liquor licence. We really hope that the museum can find a way of getting this place going again. Marinika Babanazarova, the director of the museum, can organize coffee and biscuits for visiting groups if given advance warning. This page was first published on 1 April 2008. It was last updated on 2 March 2012.